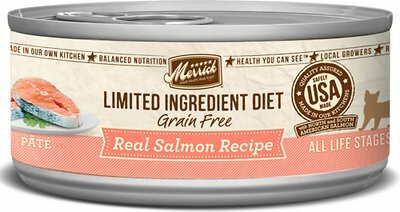 Give your sensitive kitty the simple nutrition he needs with the Merrick Limited Ingredient Diet Grain-Free Real Salmon Pate Recipe Canned Cat Food. 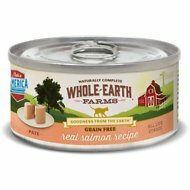 It’s packed with high-protein, tender salmon as the first ingredient and only animal protein source, and prepared into a whisker-licking pate even picky eaters love. Loaded with antioxidants to support immunity, omegas for a healthy skin and coat, plus vitamins, minerals and taurine in every bite, it’s sure to fuel all your kitty’s adventures, and then yum! Plus, it has zero grains, artificial colors, flavors or preservatives so you can let kitty dive right into his bowl every time. Grain-free recipe features protein-rich salmon as the first ingredient for the essential nutrients to support healthy muscles and energy. 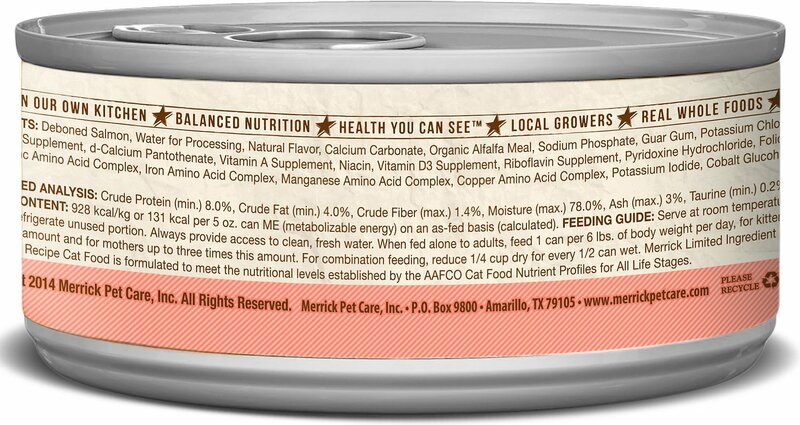 Single animal source protein is great for kitties with sensitivities and allergies, or on limited ingredient diets. Enhanced with added vitamins, minerals, taurine and essential moisture for hydration and overall health. Made in the USA with zero grains, wheat, corn, soy, artificial colors, flavors or preservatives. Serve at room temperature. Cover and refrigerate unused portion. Always provide access to clean, fresh water. When fed alone to Adults, feed 1 can per 6 lbs of body weight per day, for kittens up to twice this amount and for mothers up to 3 times this amount. For combination feeding, reduce 1/4 cup dry for every 1/2 can wet. 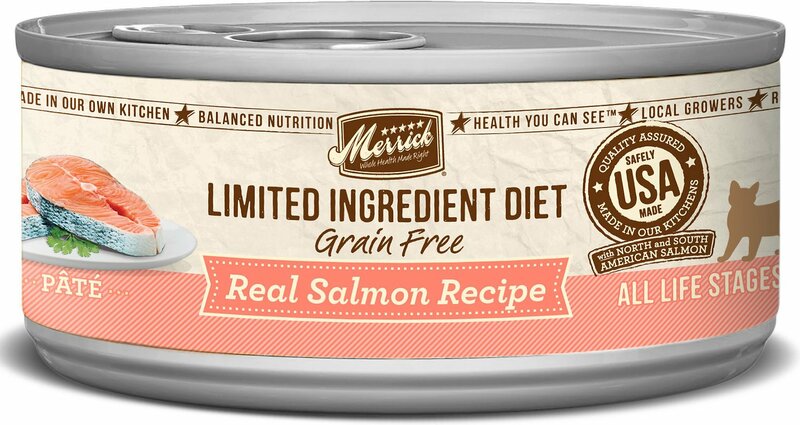 Merrick's Limited Ingredient Diet recipes are specially formulated with a limited number of carefully selected ingredients to provide complete and balanced nutrition for your cat with food sensitivities. 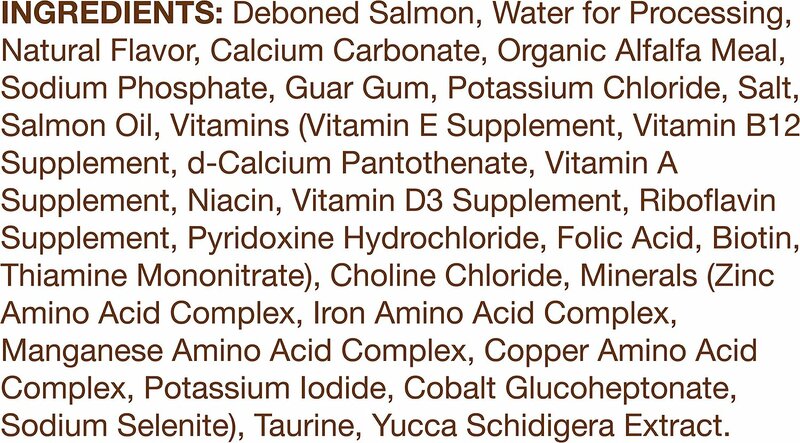 They provide all the nutrition you'd expect from Merrick, with very few ingredients. These recipes keep it simple with a single source of animal protein — including salmon, turkey, chicken or duck — and easily digestible carbohydrates, for the perfect balance of ingredients. They are formulated to deliver a range of important vitamins, minerals and fatty acids necessary for the overall well-being of your cat. Great source of B vitamins, carbohydrates, zinc, vitamin C, copper, iron, magnesium, niacin and potassium. Supplies good quantities of iron, magnesium, manganese, phosphorus, selenium and silicon, and is thought to reduce stool and urine odors. One of our cats was having issues with diarrhea with her previous wet food. Our vet had recommended this brand due to its limited ingredients. She absolutely loves it and has had no diarrhea! It is pretty pungent but not enough to make it stop buying this flavor. This particular variety had a super stinky-fishy odor and also made our cats’ pee/poop very foul smelling. The other salmon recipes we’ve tried were not like this, including Merricks salmon pate with carrageenan. I’m not sure we got a fowl batch, or if this is the nature of this limited edition salmon pâté. I have tried many things trying to find a food that his GI system will tolerate. So far, this seems to be doing ok. I have a finicky kitty and she loves this. I've noticed a significant improvement in her indigestion issues since switching to this food. I had purchased a batch and it was working fine for my cats who have IBD. However, the last purchased batch was so hard and dry it barely came out of the can. I had to scrap it out. My one cat who eats anything and everything threw up while eating it and refused to eat anymore. I even left an open can on the counter by accident and no one touched it. I am at a loss because there are few choices for limited ingredient salmon wet food and I am really disappointed in the quality of this food. The food is too expensive to have this happen and now I feel I cannot trust them. Sounds real good, except my kitties won't eat it. 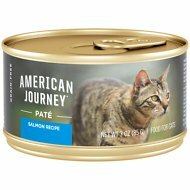 It's a very wet and mushy pate, got it specifically for my girl kittie who has some intestinal issues. Only, she hates it. Boy cat, who will eat anything, might eat it if I don't replace it with something else. My cat Zachary has been difficult to find food for as he seems allergic to many canned foods. The Merrick limited edition diet foods don’t make his skin itch, and he seems to love the taste. We are both grateful to the Merrick folks for making their LID food available and at a reasonable price. I was surprised that the consistency was so solid and difficult to get out of the can. My boys (4) left some in their dishes every time.